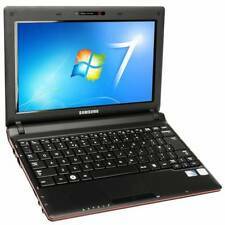 CHEAP Samsung N145 Plus 10.1" Intel Atom 2 GB RAM 160 HDD Webcam Win7 NoteBook. Samsung N145 Plus. Webcam YES. Hard Drive 160 GB. Open Office- Good For Word Processing, Spreadsheets, Presentations, Graphics, Databases and more. VLC Player- Good For Watching Movies. CHEAP 17" TFT Monitor - Assorted Makes- Acer Dell HP Hanns G (FREE CABLES). Samsung N145 Plus Notebook Laptop intel Atom 1.66GHz with Windows 7 starter and fabric case, also included is Microsoft Works 7.0. Used, clean condition. Reset to factory settings/state. Power slide/button missing, but still able to switch on via pin/clip. (Switch/power button can be replaced) otherwise fully working. Battery is good, but decreases when not connected to power source. Power cable included. Upgraded to 2GB Memory. Laptop not been used in a few years, so require all updates throughout. Dispatched via hermes with signature required. No original packaging but will be wrapped & boxed for shipping. Any questions please ask. THE PHOTOS ARE OF AN IDENTICAL NETBOOK THAT HAS ALREADY BEEN SOLD. Storage: 250GB HDD. The netbook is in great condition and the battery life is also good. Samsung N Series N145 Plus 10.1" (250GB, Intel Atom, 1.66GHz, 1GB) Netbook. Condition is Used. Dispatched with eBay delivery – Shutl 1 day. Running Lubuntu Linux, small cover piece that connects screen to keyboard missing as shown in photo. I prefer to use this rather than my iPad. I have also included the following. CHEAP Samsung N145 Plus 10.1" Intel Atom 2 GB RAM 80 HDD Webcam Win7 NoteBook..
CHEAP Samsung N145 Plus 10.1" Intel Atom 2 GB RAM 80 HDD Webcam Win7 NoteBook... Condition is Seller refurbished. Dispatched with eBay delivery – Shutl 1 day. CHARGER NOT INCLUDED. Black Samsung N150 Plus Netbook. The netbook is in a used but very good condition. Power adapter. Windows 7 Starter Edition. Worried about reliability?. Because a life on the go can often trip you up, the Samsung N145 Plus is crafted to not let you down. It also has new advanced communication technologies that let you jump online almost anywhere. Product Line Samsung N Series. RAM Max Supported Size 2GB. Hard Drive Capacity 200GB. Display Size 10.1". FULLY TESTED WORKING. but we dont' know battery life. Data Link Protocol Fast Ethernet, Ethernet, Ieee 802.11n, Ieee 802.11g, Ieee 802.11b. Cheap Samsung N145Plus netbook with webcam. WEBCAM: Yes. built in WiFi. SOFTWARE INSTALLED: Windows 7 Starter 32-bit, Open Office 4.0.1. (Software cd not included ). For sale we have COA: Windows 7 Starter. WHAT'S INCLUDED: - Laptop ONLY. WHAT'SNOT INCLUDED: - Power adapter / Other accessories / Cables / Software / Drivers etc. - Right hinge cover is missing. TESTING: - The unit Powers up to BIOS fine with no errors or passwords. Samsung N145 Plus. The power adapter is included. Clean inside and outside. - SD flash card reader. Both plastic hinge covers are missing though. The hinges work alright. No broken parts. The screen is intact. Briefly function tested. The hard drive may require initialising as part of the installation process. Power Test Only – The item has been plugged in and the power button has been pressed and the light shines to show the item turns on. SAMSUNG N150 10" NETBOOK WINDOWS 7 STARTER216GB HDD. The above item is being sold as “Spares or Repair”, so “NO” Warranty will be applied to the product. Includes Hard Drive Cover / Caddy Screen Appearance Top Casing Condition Bottom Casing Condition. Yes, Windows 7 Starter COA. Hard Drives if included have been securely data wiped and are blank - they will also have been 100% verified for bad sectors. Other Notes Serial Number No password, boots to bios. Yes, Windows 7 Starter COA. Hard Drive Optical Drive Hard Drive Cover Hard Drive Caddy Hard Drives if included have been securely data wiped and are blank - they will also have been 100% verified for bad sectors. Missing 10 keys. Yes, Winodws 7 Starter COA. Hard Drive Optical Drive Hard Drive Cover Hard Drive Caddy Hard Drives if included have been securely data wiped and are blank - they will also have been 100% verified for bad sectors. This laptop is being sold as spares or repair. 10.1" - Broken screen. CPU Speed Hard Drive Optical Drive Hard Drive Cover Hard Drive Caddy Hard Drives if included have been securely data wiped and are blank - they will also have been 100% verified for bad sectors. Samsung NoteBook N145 Plus. Not tested any further. No hard drive. Samsung NoteBook N145 Plus. Not tested. No hard drive. Samsung N145 Plus 10.1" Intel Atom 2 GB Ram 80 HDD Webcam Windows 7 NoteBook..
Samsung N145 Plus. Webcam YES. Hard Drive 80 GB. Open Office- Good For Word Processing, Spreadsheets, Presentations, Graphics, Databases and more. VLC Player- Good For Watching Movies. We do just give the check warranty of battery on arrival.